I’m traveling for work this week and trying to type up this post on my iPad with two index fingers, while snuggled into the hotel bed for warmth while waiting for the heat to kick on. So that should be your hint right there that this will be short (and grammatically interesting from what I’ve seen from my auto-correct so far), but I didn’t want to miss posting about such an unusual recipe. 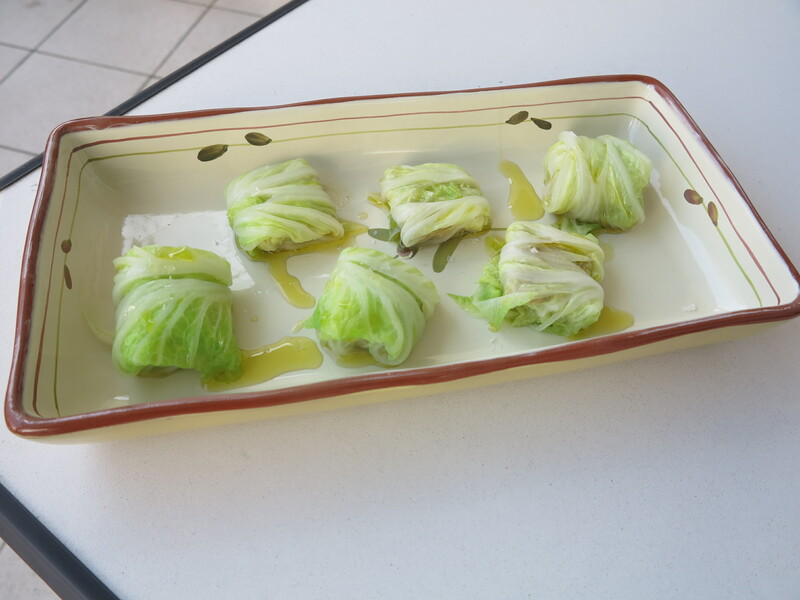 Knowing that I would be on the road this week, I actually made this week’s French Fridays with Dorie recipe, Cabbage and Foie Gras bundles, a few weeks ago. The exercise did not get off to a great start. First off, I love foie gras and was pretty darn skeptical that wrapping it up in cabbage leaves and then steaming it was going to add to my enjoyment of this rich little delicacy. But like a good little Dorista I jotted down Dorie’s instructions and set off to the store. It was there that this recipe was almost completely derailed. 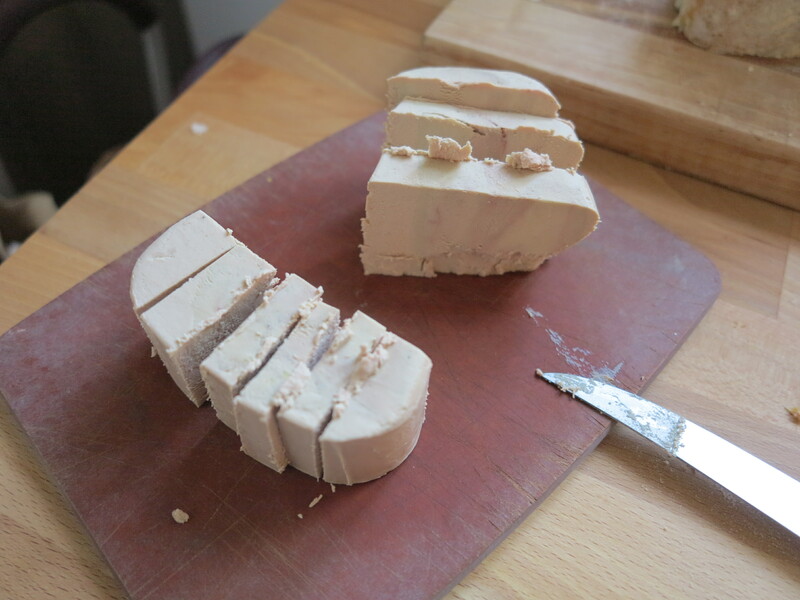 I started asking the lady at the poultry counter which of her tasty-looking foie gras terrines (seriously auto-check? “termites”?) was made from whole foie gras and not mousse. She naturally asked how I planned to serve it (a very common question here which usually leads to helpful service and advice), but oh, oh you should have seen the look on her face! Seriously folks, I was almost starting to worry that she might decide not to sell me any of her precious stock, for fear of what I was going to do to it. In the end I convinced her and she sent me off with a sad shake of her head. Frankly, at this point I was pretty in agreement with her and my husband apparently too, because he suggested that we split do a half recipe and save the rest for more traditional consumption. I readily agreed. It was a decision which we both regretted later. Seriously, as unlikely as this dish sounds, we both really enjoyed it. We served it simply with some toasted sourdough and a glass of wine. Delicious! Who knew! This entry was posted in blogosphere, french fridays with dorie and tagged Around my French Table, starters. Bookmark the permalink. I would have loved to see the salespersons face… she probably thought you were crazy. So glad someone enjoyed this. Stay warm. I do wish I could have tried this with the proper type of foie gras (I used a pate), but it would have been very expensive. This is one of those situations where I wish I live near some other Doristas so we could have gone in together to buy the terrine. I’m glad you two enjoyed this one! Love your story about the saleswoman. I wish you could have taken a sample back to her. So far you and your husband are giving this recipe the best review. I do think using the right ingredients may have had something to do with that. So glad you and your husband liked this. There were few takers this week, and not many likers. Have a good trip. Glad this worked out for you – good foie gras is delicious and I am sure that made all the difference. You get extra points because you not just liked, but loved this one. Dorie is full of surprises, isn’t she? I get such a kick out of reading everyone’s reactions and am so delighted that you and hubby enjoyed this. How cool. And converts no less, questioning it going in (have had more than my fair share of those Friday’s). Love the story about the sales clerk. Also the iPad since I am at work during lunch hour trying to leave comments so I don’t fall behind….but wishing I were home on my MAC – lol. I hope you warm up soon. Glad this was a hit for you. It was nice to read a post that someone liked it. Thanks for duck fat potato recipe. LOL, that’s awesome about the lady at the poultry counter. We did the same thing: half recipe for this dish and used the other half of the foie for another recipe. Unfortunately, my husband was not fond of this one. I agree with you and liked it! Glad you all enjoyed it so much and it looks lovely! I loved reading this. I hope you have a chance to tell the woman at the store how well your recipe turned out 🙂 I’m so glad you both enjoyed this one. I hope you had a good rest of your trip.